A busy period ahead, so please put some dates in the diary. This was the first year that we have taken a team to the Seibukan children's competition in Nottingham. The club had booked a coach for the day so we could travel together. I sensed a mix of excitement and apprehension from team SSKC : Liam and Rose Dunne, Berhan Harker, Sam Barfield, Lydia Gutherie, Harrison Kirk, Emily Crockford, Heath Waters, Leah Fielding, Joshua Whiteley, Charlotte Haxby, Bradley and Lewis Urwin, Wiktoria Rymarz, Ibrahim and Imaan Ahmad, Myles Phillips and Phoebe Culpan. Our aim was not to go and win, but to just to take part and provide our karateka with a positive competitive experience. This was achieved and even our younger less experienced members who are just learning their first kata enjoyed the day. Just watch the montage of photos to get a flavour of the success. 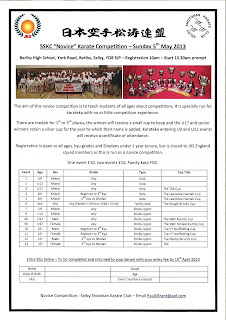 This is a novice competition for JKS karateka in and around Yorkshire. Please arrive for registration promptly so everyone can be processed before the competition is due to commence. The Sports Hall, Barlby High School, York Road, Barlby, Selby. YO8 5JP. Entries to be made to your club instructor who has full details of the event.